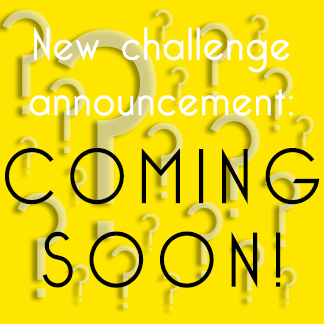 I love the monthly challenges although I am usually not organised enough to post anything in time (even in a whole Amnesty month I end up doing it on the last day!). But I do have several exciting things to share and they are all very floral! 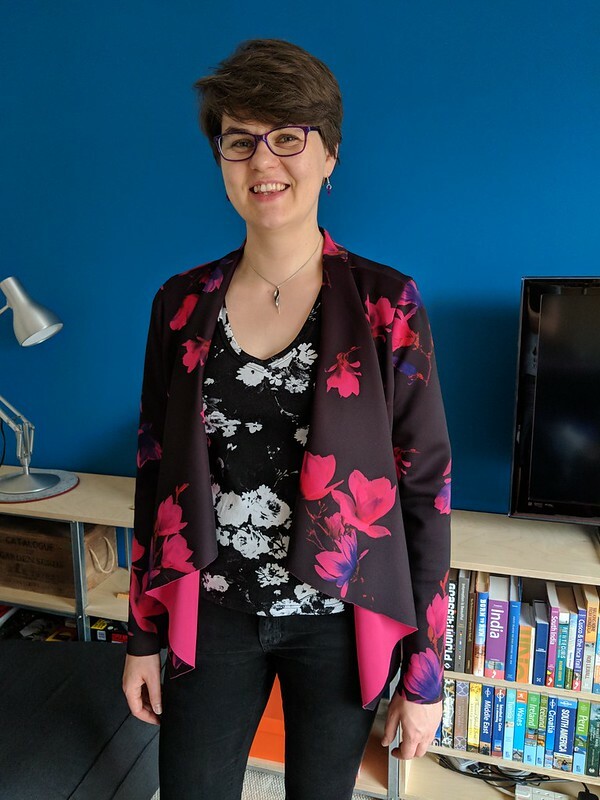 The first one is a waterfall jacket / cardigan made in a lovely scuba fabric I picked up just before Christmas from the Fancy Silk Store in Birmingham, which I thought would be perfect for this pattern as the wrong side of the fabric is on show and I love the vivid pink. The pattern is a Knipmode one (from the January 2017 issue) and it went together very nicely! I left the edges raw to avoid the bulk and I like how the front drapes in the quite structured scuba. I also made the t-shirt underneath, which is a V-neck version of the Green Tee by Greenstyle. I hacked a long sleeve onto the t-shirt and made it in a lovely cotton jersey. I finally figured out the twin needle settings to stop it tunnelling too (well, mostly) – I got a second bobbin case for my machine so that I could lower the tension on the bobbin thread. The V-neck is a tiny bit off if you look closely but on the whole it came out very nicely (and I love the fit of the pattern). 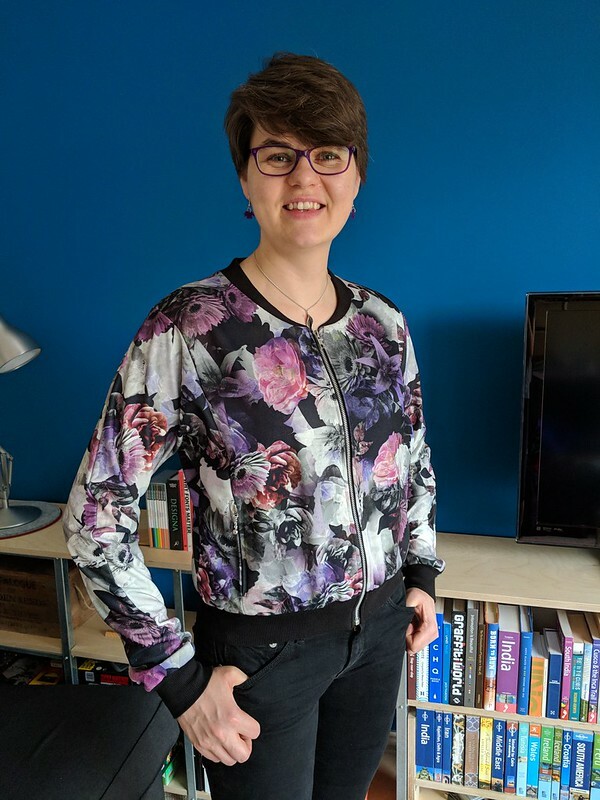 The next project was a bomber jacket, also from a Knipmode pattern (from the March 2017 issue), which I made in a crepe scuba jersey and cotton ribbing (the scuba crepe came from Fabworks). I had to put the separating zip in twice to make sure the ribbing didn’t stretch out too much, but it was worth it to get quite a neat finish! 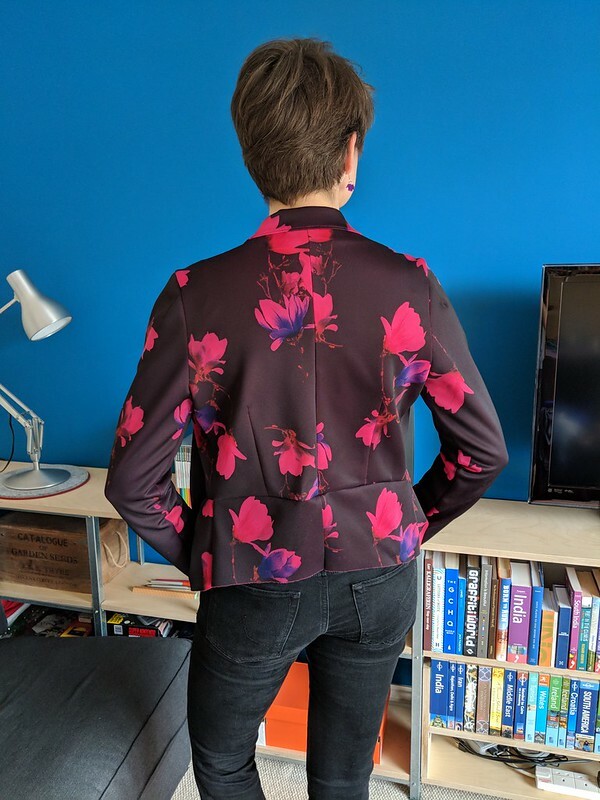 The topstitching around the zipped pockets is not entirely straight but luckily the print mostly hides this 🙂 I think for the next one I will add a little bit of length to the body as it rides up a little bit. But my partner reckoned that the fabric and pattern combination looked quite like Ted Baker, so very pleased with that! 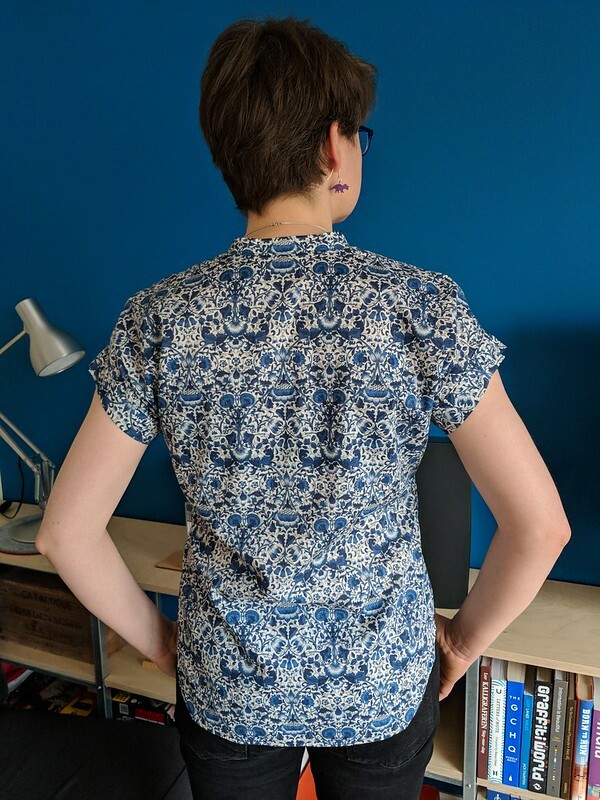 The last one is my second Melilot shirt (a Deer and Doe pattern), which I made in a lovely Liberty tana lawn (with French seams of course). I did a swayback and a broad back adjustment and the back hangs a lot better than my first one. 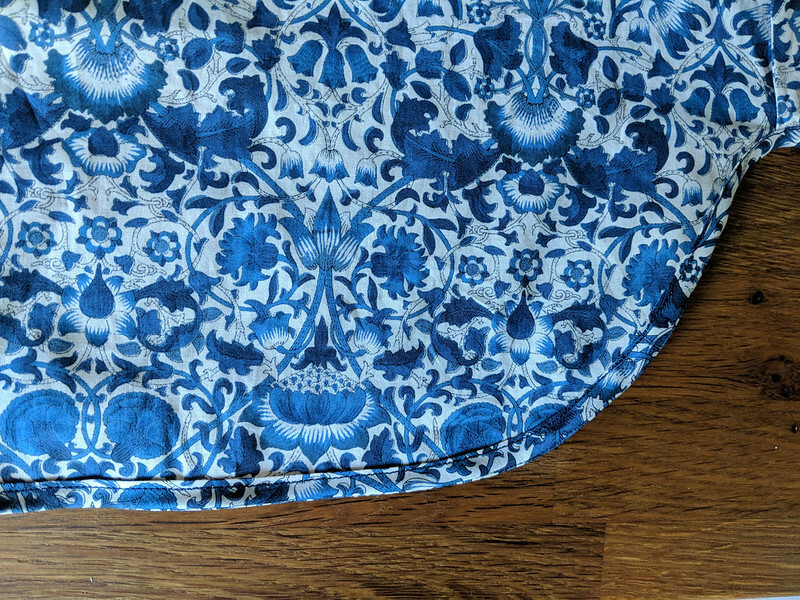 I also got some excellent advice from the Fold Line facebook group on how to do a neat hem and I made matching bias tape and it made for a lovely neat hem! 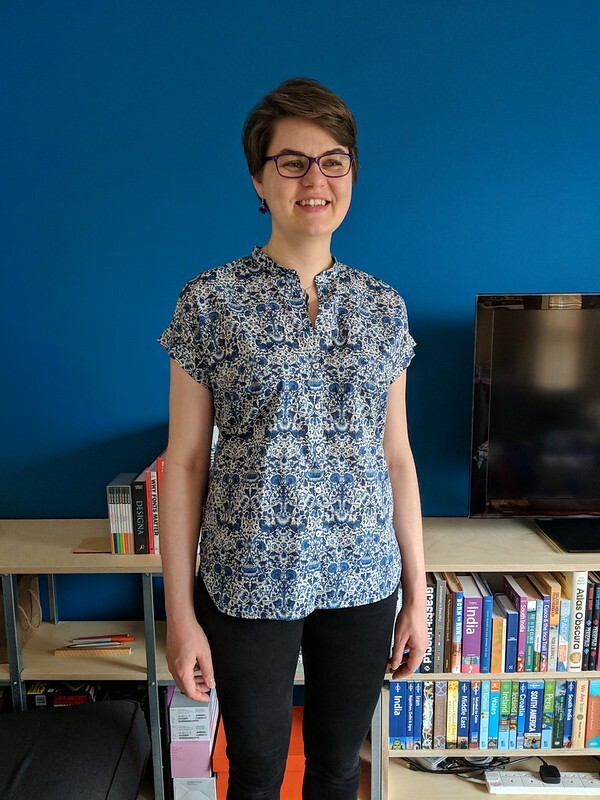 I am really loving this shirt and am planning several more! Great choice of fabric on that waterfall jacket! I love the pink. I had such good intentions for Amnesty Month, but I didn’t write anything. The garments are done! Some have been done for months! Oh well. Stunning creations! They look fabulous on you and I hope you have fun wearing all these different items. Floral prints are my absolute favourite. Gorgeous outfits, girl! You have a lot of talent! Thank you!! I’m really enjoying having some things that I can wear to work 🙂 I just need to get faster so I join the themes in time!